The camouflage trend is super hot right now, but if you're not careful, you can look as if you just stepped off the battlefield. There are a few simple rules to follow to keep your look on trend without going over the top. 1. If you are wearing camo pants, pair them with a brightly colored top. I love this look from Carly from Thirtysomethingfashion. I would have never considered wearing red with camouflage until I saw Carly's gorgeous pairing. 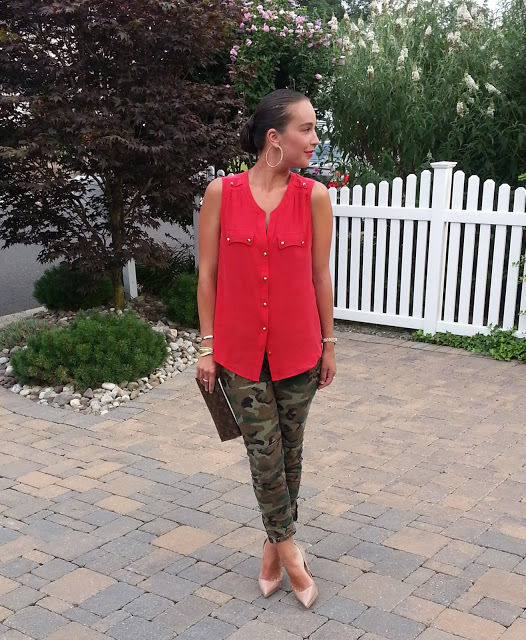 Don't miss more tips from Carly on styling camo with red. 2. Choose a simple camouflage print accessory. If you can't imagine wearing camouflage clothing, why not try a simple accessory instead? If you do choose to wear any piece of camo clothing, DO NOT pair a camo accessory with it. It's camo overload. Jackets and hoodies are another fab way to wear the camouflage trend. Again, it's all in the cut and detailing when wearing camouflage. Otherwise, you'll look like a hunter or a soldier. Carly looks great in this trend as well. The crisp white button down shirt and hoop earrings add the feminine details that this jacket needs. And take a cue from Carly, pair a camo jacket with jeans for a balanced look. I also love a camo hoodie, and these denim style camo jackets are fun too! Do you currently own any camouflage clothing? I have a pair of skinny capris that I love. I bought them at Urban Outfitters over the summer for just $40. I practically live in them. If you don't own a camouflage item, are you inspired to buy something after reading this post?